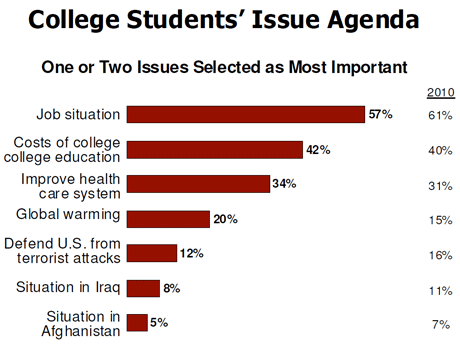 The Panetta institute’s 2011 survey found U.S. college students had turned dramatically more negative in their views of where the country was heading. The students also expressed serious concerns about the economy and called for more bipartisan cooperation in Congress. Despite a desire for job growth, on fiscal issues the 2011 Panetta survey suggested that U.S. college students saw the long-term threat of the federal deficit. When asked whether they would set a higher priority on federal spending to help the economy recover or reducing the budget deficit, students chose deficit reduction by 62 percent to 36 percent, in spite of their clear concerns about the struggling economy.